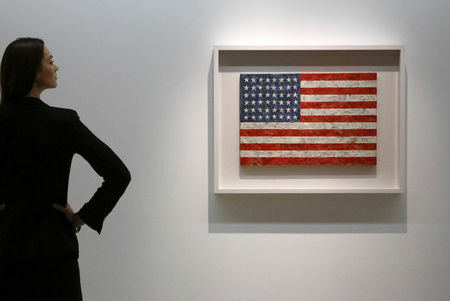 Laura Vere-Hodge of Christies surveys "Flag" by artist Jasper Johns. The painting is part of the collection of Michael Crichton, best selling author of Jurassic Park, which highlighted a sale of post-war and contemporary art at Christies in New York on May 11. REUTERS/Kevin Coombs. NEW YORK, NY.- The quality, scope and innovative vision of the late author Michael Crichton’s collection of contemporary art compelled buyers at Christie’s on May 11. 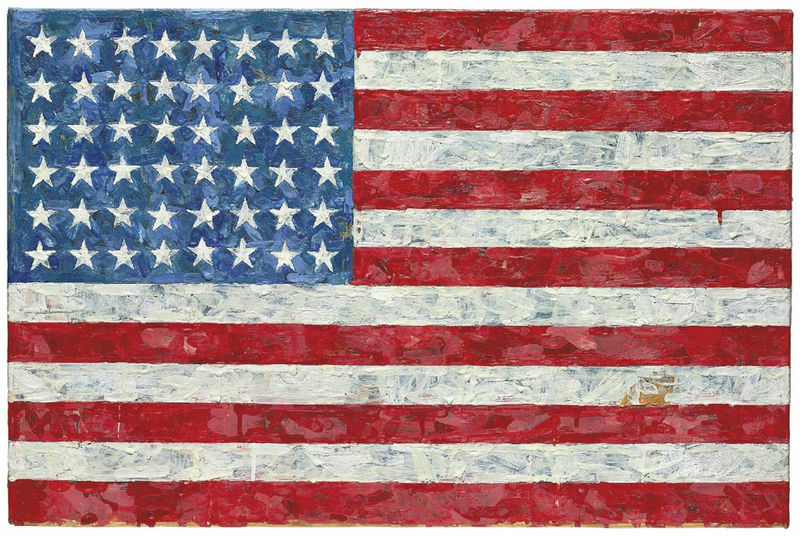 The focal point of the sale was Jasper Johns’ Flag, 1960-1966, selling for $28,642,500 million (£19,476,900/€ 22,627,575) (estimate: $10 million-$15 million), the highest price ever achieved for a work by Johns at auction. 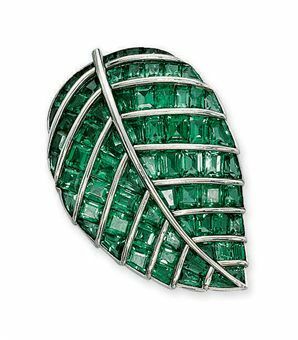 The collection realized $93,323,500 (£63,459,980/€ 73,725,565) and sold 100% by lot and by value, becoming one of the most significant. Four bidders vied for the flag which took two minutes to sell ending at 6:55 pm. The winning bidder was a member of the U.S. art trade. Completed by Johns in 1966, the work, executed in encaustic, was purchased by Crichton over thirty years ago from the artist’s own collection. It was last seen in public in 1992 and was a key piece in the comprehensive and prized collection cultivated by the best-selling author of Jurassic Park. Johns’ iconic American flag are credited with jumpstarting the Pop art movement; paving the way for the avant garde works of Andy Warhol and Roy Lichtenstein in the mid 1960’s. The previous record was for Johns’ Figure 4, 1959, encaustic and printed paper collage on canvas, sold at Christie’s in May 2005 for $17.4. 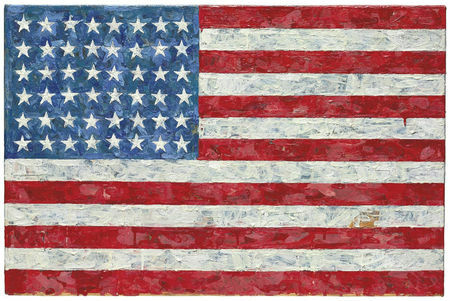 Jasper Johns’ Flag, 1960-1966, selling for $28,642,500 million (£19,476,900/€ 22,627,575). Estimate: $10 million-$15 million. signed 'Johns' (on the underside); signed again and dated 'J. Johns 1960-'66' (on the reverse), encaustic and printed paper collage on paper laid down on canvas, 17½ x 26¾ in. (44.5 x 67.9 cm.) 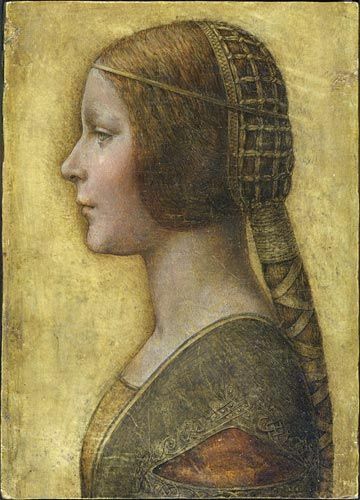 Painted in 1960-1966. Literature: R. Bernstein, Jasper Johns' Paintings and Sculptures 1954-1974: The Changing Focus of the Eye, Ann Arbor & London, 1975 and 1985, pp. 9 and 145. G. Boudaille, Jasper Johns, New York, 1989, p. 127, no. 51 (illustrated in color). A. Duncan, "Pop Art," Montreal Gazette, 24 October 1992, p. J2 (illustrated). Jasper Johns Flags: 1955-1994, exh. cat., Anthony d'Offay Gallery, London, 1996, p. 79. Exhibited: Montreal Museum of Fine Arts, Pop Art, October 1992-January 1993, pp. 65 and 277, pl. 1, no. 78 (illustrated in color). Notes: "One night I dreamed that I painted a large American flag, and the next morning I got up and went out and bought the materials to begin it. And I did" (Johns, quoted in K. Varnedoe, Jasper Johns: A Retrospective, exh. cat., New York, 1996, p. 124). Jasper Johns' Flag is recognized as one of the greatest icons of Modern Art alongside Picasso's Guernica and Andy Warhol's Marilyn. Appropriating the supreme image of American national identity, famous the world over, Johns' Flag paintings are often seen as the crucial stepping stone between the supremacy of Abstract Expressionism and subsequent movements such as Pop Art, Minimalism and Conceptual Art - profoundly influencing artists as diverse as Andy Warhol, Roy Lichtenstein, Ed Ruscha, Donald Judd and Brice Marden. Flag, 1960-66, is a painstakingly beautiful rendition of the American Flag. Bought directly from the artist's own collection over thirty years ago, it is one of only a handful of paintings by Johns that stays true to his original iconic image of the single flag in red, white and blue. Johns painted the work in encaustic, a difficult and seldom-used technique that dates back to the ancient Egyptians, in which pigment is mixed with hot wax and applied in meticulous brushstrokes to the surface. As was often his method, the artist used one of his Flag prints as a template for the Flag design, wrapping the paper around the sides of the stretcher. Johns completely covers the surface with encaustic as well as painting the red, white and blue stripes over the edges of the painting. He has placed torn newspaper collage within the encaustic to create an additional layering of surface and to introduce an aspect of the real, everyday world into his art. The fast-drying medium of encaustic enabled Johns to give each brushstroke a distinct and luxurious substantiality, the richly varied surface ranging from translucent to opaque. The Flag motif is contiguous with the perimeters of the picture, while the painted sides force the viewer to contemplate the "objecthood" of the work. It was the literalness of Johns' Flag that was so revolutionary: during a time when abstraction was the dominant style, Johns created a picture that took trompe-l'oeil to a new level. Where René Magritte's 1929 painting La trahison des images had the words "Ceci n'est pas une pipe" under a picture of a pipe, Johns now painted a Flag and declared that it was just that - a flag. As with his Targets, he selected images that were already semi-abstract: it is the appearance of the American flag or the concentric circles of a target that defines it as such, rather than any intrinsic properties as objects. Thus, the boundary between representation and reality is blurred. Anticipating Frank Stella's statement, "What you see is what you see," Flag declares that what Johns paints is what Johns paints. In his 1997 television series American Visions, Robert Hughes explained that the original source material, Old Glory, is itself, "an abstraction - the most recognised abstraction in the world," going on to voice the conundrum that lies at the heart of the Flag and which would prove such a lasting influence on artists to this day: "Is a picture of an abstraction a representation? Is this a flag or a painting?" In 1960, Johns addressed this paradox: "Two meanings have been ascribed to these American Flag paintings of mine. One position is: 'He's painted a flag so you don't have to think about it as a flag but only as a painting.' The other is: 'You are enabled by the way he has painted to see it as a flag and not as a painting.' Actually both positions are implicit in the paintings, so you don't have to choose" (Johns in 1960, quoted in S. Rodman, "The Insiders: Rejection and Rediscovery of Man in the Arts of Our Time," p. 82, K. Varnedoe (ed. ), Jasper Johns: Writings, Sketchbook Notes, Interviews, New York, 1996, p. 82). It was this paradoxical balance that led to Flag's immense influence, placing Johns at the vanguard of contemporary art during the late 1950s onwards. In its emphasis on its own status as an object, Flag is the precursor to Minimalism; and in its reintroduction of figuration and use of imagery taken from the everyday, image-saturated world around us, it launched Pop Art. Johns was still in his 20s when he first dreamed of the Flag in 1954. During that period, he had been living in New York and working in near isolation, ignoring many of the debates and frustrations raging in the avant-garde of the time, which remained under the sway of the Abstract Expressionists, now well into a second or even third generation. Johns had recently destroyed almost all of his earlier works, and was determined to find his own idiom. One of the few artists he knew at the time was Robert Rauschenberg: the pair had studios in the same building and saw each other almost every day, discussing art, inspiring and motivating each other. Johns remained in near cultural seclusion: when the dealer Leo Castelli was brought to his studio by Rauschenberg, he discovered an entire oeuvre, later describing that moment as, "Probably the crucial event in my career as an art dealer, and... an even more crucial one for art history" (Castelli, quoted in M. Lublin, "American Galleries in the Twentieth Century: From Stieglitz to Castelli," pp. 157-163, C.M. Joachimedes & N. Rosenthal (ed. ), American Art in the 20th Century: Painting and Sculpture 1913-1993, exh. cat., London, 1993, p. 161). Johns had discovered through his Flags and Targets a means of taking a subject, rather than an object, that was a readymade. "Using the design of the American flag took care of a great deal for me because I didn't have to design it," Johns explained. "So I went on to similar things like the targets - things the mind already knows. That gives me room to work on other levels" (Johns, quoted in R. Francis, Modern Master: Jasper Johns, New York, London & Paris, 1991, p. 20). In a sense, then, Johns chose the Flag as his subject matter because it allowed the viewer to focus on other qualities than its composition. The appearance is almost arbitrary, hence Johns' claim regarding motif and medium: "I think it's just a way of beginning" (Johns, quoted in D. Sylvester, Interviews with American Artists, London, 2002, p. 159). The Flag serves as a pretext for an exploration of the nature of painting; with its composition completely filled with the motif, Johns emphasizes the objecthood of his Flag and reinforces this quality by allowing the stripes to continue over the edges. Johns deliberately sabotages the viewer's reflex suspension of disbelief and reveals the simple fact that a painting is not just a plane, but is an object projecting from a wall, another plane. This highlights Flag's ambiguous status as an artefact. At the same time, the viewer's automatic recognition of the Star-Spangled banner means that the viewer can focus on the act of painting. The subject is thus a pretext for Johns to paint, to revel in the act of mark-making itself. As he said, "the painting of a flag is always about a flag, but it is no more about a flag than it is about a brushstroke or about a color or about the physicality of the paint, I think" (Johns, quoted in ibid., p. 159). This is clear in the lush surface of Flag, which reveals Johns' interest in the act of painting, and indeed his own enjoyment of the process. While Flag places the distance between the painter and his work under a new scrutiny, intellectualizing the divide that Jackson Pollock had introduced with his drips, it also reveals in its gesturality and variety of textures his sheer delight in the act. His incredibly literal subject matter can be seen as a means of recovering the tradition of painting from the grasp of the Action Painters still active at the time, and a gleefully, irreverently figurative means at that. Johns had begun his first Flag, now in the Museum of Modern Art, New York, with household enamel paints. This did not dry quickly enough for his purpose: "And then I had in my head this idea of something I had read or had heard about: wax encaustic. In the middle of the painting I changed to that, because encaustic just has to cool and then it's hard and you don't blur it again; with enamel you have to wait eight hours. With encaustic you can just keep on going" (Johns, quoted in K. Varnedoe, Jasper Johns: A Retrospective, exh. cat., New York, 1996, p. 124). When he created this present Flag in the 1960s, Johns had become renowned for his skilled use of encaustic. His virtuosity in this medium is in clear evidence in Flag. The encaustic technique has allowed him to illustrate and underline the very process, the accumulation of gestures, by which the painting came into being. It is an impassioned inventory of marks, allowing Flag to become a self-conscious record of its own creation, a notion emphasized by the presence of the sections of newspaper which have been dipped in the wax and applied to the surface in places. There is a sense, then, in which the surface of his picture acts as a proof of movement, a proof of life, documenting each artistic decision and each motion taken by Johns. The critic Robert Rosenblum wrote of Johns' Flag paintings: "Is it blasphemous, disrespectful, simple minded or recondite." In the 1950s, the legendary curator Alfred H. Barr, Jr. had been reluctant to buy the first Flag for the Museum of Modern Art, as he feared that the Museum Board would consider it unpatriotic. Despite Johns' protestations to the contrary, Old Glory is a loaded image, and this was all the more the case during the 1960s when Flag was created, during McCarthyism and the controversial increase of military involvement in Vietnam. Then as today, the flag carries with it countless interpretations and implications. It is worn and flown by proud Americans, has been seen draped over soldiers' coffins returning from Vietnam, Iraq and Afghanistan alike, burned in protests in the States and the Middle East, defended by legislation from being disrespected. Indeed, it comes with its own set of abstract rules, the United States Flag Code: it should not be dipped, should only be hung upside down in case of distress, should be well-maintained and, if not, properly disposed of. Was Johns' choice of motif, then, the wilful act of a young rebel or an act of worship from a devout American who himself had served in the U.S. Army? Was Johns deliberately attacking the Abstract Expressionists, considered the States' first home-grown artistic movement, by rubbing their noses in such emphatic, flag-flying figuration? His choice of motif may find its parallel in Jimi Hendrix' Star-Spangled Banner, played at Woodstock only a few years after Flag was completed: his reverb-drenched reinvention of the national anthem was adopted as an anti-war cry, yet Hendrix's own decision to choose it and play it may have owed more to its merely being around and to his own years in the 101st Airborne Division; he himself said of his choice, voicing a sentiment similar to that in Johns' Flag, "I'm an American, so I played it. They used to make me sing it in school, so it was a flashback" (Hendrix, quoted in C.J. Farley, "A Personal National Anthem," The Wall Street Journal, 3 July 2007, reproduced at online.wsj.com). When asked whether his choice of subject-matter was deliberately anti-establishmentarian, Johns gave a simple, though perhaps disingenuous explanation: "To me the flag turned out to be something I had never observed before. I knew it was a flag, and had used the word 'flag'; yet I had never consciously seen it. I became interested in contemplating objects I had never before taken a really good look at. In my mind that is the significance of these objects" (Johns, quoted in A. Pohlen, "Interview mit Jasper Johns," 1978, pp. 170-73, Varnedoe (ed. ), loc. cit., 1996, p. 171). In this, he echoed the Philosophical Investigations of his great hero, Ludwig Wittgenstein, published in 1953: "The aspects of things that are most important for us are hidden because of their simplicity and familiarity. (One is unable to notice something because it is always before one's eyes.) The real foundations of his inquiry do not strike a man at all. Unless that fact has at some time struck him - And this means: we fail to be struck by what is most striking and powerful" (Wittgenstein, quoted in R. Bernstein, Jasper Johns' Paintings and Sculptures 1954-1974: The Changing Focus of the Eye, London, 1985, p. 94). By placing the Flag in a new context, by surprising the viewer and locating it within the realm of art, Johns has taken something from the everyday world around us and allowed us to view it with new wonder. It is a revelation, a contemporary epiphany: in the mysterious transformative act of rendering it as a painting, the artist himself has refused to take for granted this formal composition, this masterpiece of simple, bold design with its powerful red, white and blue in the stars and bars. As Michael Crichton explained, "The flag, the familiar image, becomes unfamiliar in a way that re-creates childish awe, the vision of a truly naïve observer. We look at it with the blatant curiosity of someone who has never seen a flag before - not because we haven't, but because it is 'out of place' in a new setting, and because it is treated in a new way" (M. Crichton, Jasper Johns, exh. cat., New York, 1977, p. 87). Another record was set for Mark Tansey’s Push/Pull, 2003, sold for $3, 28300 (₤2,188,580/ € 2,542,615) (estimate $800,000 to $1.2 million). The previous record for a Tansey was $3,040,000. Further highlights included Ed Ruscha’s Voltage, 1964 that sold for $1,650,500 (₤776,900/ € 902,575) (estimate $700,000 to $1 million), Robert Rauschenberg’s Trapeze, 1964 which went for $6,354,500 (₤ 4,321,060/€ 5,020,055) (estimate $5 million to $7 million) and Andy Warhol’s Mao, 1973 that sold for $2,378,500 (₤ 1,617,380/ € 1,879,015).